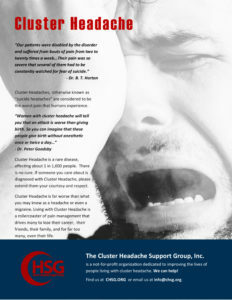 Bouts of cluster headache may be resistant to all the drugs usually effective, such as typical migraine preventing drugs, lithium, carbamazepine, valproate, and corticosteroids. Corticosteroids have been commonly used in cycles of 10–15 intravenous daily infusions of 50–100 mg prednisone. During a severe bout in a patient resistant to all treatments, we have tried high dose (500 to 1000 mg/day intravenously) methylprednisolone administration: single doses were found to be effective in blocking headache attacks for several days.